How our day goes is not always determined by our mornings, but having a decent start can certainly help the rest of it along. If you wake up on time, manage to bathe, eat, and remember to wash your thermos out so you can take coffee to work, then you’re doing pretty good. However, coffee is a big part of that equation, and should you forget to set up the grounds and water the night before, then it’s iffy whether or not your morning brew will be ambrosia or swill. If you’d like to take the possibility of human error out of the equation, then the Smarter Coffee Maker will be your new best friend in machine form. This connects with your smartphone, and will grind and brew fresh coffee whenever you ask for it. It can make anywhere from 1-12 cups at a time, and won’t waste extra coffee. This machine will never wake in a groggy haze, putting in more grounds than necessary that will overflow the basket and cause a mess of things. All from the comfort of your bed or office chair, you can choose the strength of your coffee as well as the time you would like it to start your brew. This will cost you around $228, and is currently only available for preorder. This will be joining the ranks of instant cafe-quality drinks such as Arista and the ROK, but isn’t capable of espresso. There will be some maintenance involved such as refilling the beans and water or emptying the grounds, but these are fairly simple tasks. Smarter has found an excellent niche in the smarthome segment and is executing it well. 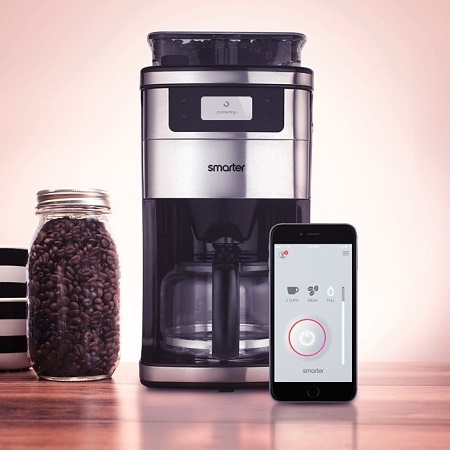 First with the iKettle and then with this Coffee Maker, it is a strong player to watch out for.